Vladimir Putin took part in the plenary session of the 15th anniversary meeting of the Valdai International Discussion Club. The main topic is The World We Will Live In: Stability and Development in the 21st Century. The plenary session moderator is Fyodor Lukyanov, Research Director of the Foundation for Development and Support of the Valdai Discussion Club. The Valdai Forum opened in Sochi on October 15. Its participants – 130 experts from 33 countries – are discussing Russia’s political and socioeconomic prospects as well as social and cultural development and place in the modern world. The Valdai Club was established in 2004. 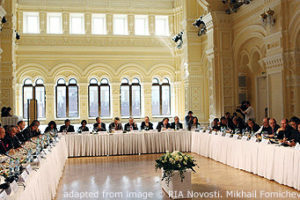 Traditionally, the forum participants meet with Russia’s senior officials as part of the annual meetings. Following the plenary session, Vladimir Putin held an informal meeting with several members of the Valdai International Discussion Club, including member of the Political Bureau of the Central Committee of China’s Communist Party Yang Jiechi, former President of Afghanistan Hamid Karzai, Executive Secretary of the Comprehensive Nuclear-Test-Ban Treaty Organization Lassina Zerbo, former UN Under-Secretary-General Jean-Marie Guéhenno, Research Director of the Foundation for Development and Support of the Valdai Discussion Club Fyodor Lukyanov, General Director of the Hermitage State Museum Mikhail Piotrovsky, and public activist Natalia Solzhenitsyn. Let’s begin our final session. As per tradition, we have President of Russia Vladimir Putin here as our guest. Mr President, in case you have forgotten, you are here for the 15th time. How are you? President of Russia Vladimir Putin: First, I would like to speak to the permanent participants of our meeting. It is true, 15 years is quite something. I believe that the Valdai Club, as we called it because the first events took place in Novgorod, has become a good international platform over these years, a platform for professionals who are interested in global politics, the economy, culture as well as the work of media. Of course, in relation to Russia. As a rule, these are experts on Russia. And we would like very much for people who work with Russia to have such a platform, so that we could meet and you could hear our position on all matters of interest for you, your countries, and for us, for Russia, not in someone’s retelling, but firsthand, from me and my colleagues. These discussions have always presented different and sometimes even opposite points of view. I think that this is the advantage of this discussion club; we call it a discussion club because where there is only one, right point of view, there is no place for discussion. Truth is born from comparing different approaches to the same phenomena and various assessments. Thanks to your participation, we can reach this result. I see many world-famous politicians in this hall; here, on my right; and I would like to welcome them all, including the President of Afghanistan and our colleagues from the EAEU. I can also see scientists, cultural figures and journalists. I hope that today’s meeting will also be not only useful but interesting as well. However, I am a bit confused about the format today. Usually we have several people on this stage, and the discussion lasts for quite some time. Of course, I am ready to fly solo, as the organisers suggest, but I hope that it will not take four or five times longer than usual. Thank you and let’s just skip the long welcoming remarks and go straight to our conversation, our work and our discussion. Fyodor Lukyanov: Mr President, it is true that, as you have noted, Valdai has various points of view. There have always been many opinions, and this year is no exception. Especially as we see our membership expand not only in terms of numbers, but also in terms of representation of various countries and regions, which, or course, provides for differing visions. This year we have a very busy agenda with a subject that has not been very characteristic for Valdai recently, because we usually talk about Russia practically all the time. Last time we talked about Russia was at the 10th meeting. And you certainly remember that it was a very large event; you attended, and we decided to return. Not only because many of our participants, club members, asked for this, but also because we believe (Valdai has prepared an annual report for this session) the world is facing some very serious changes. It is not only being globally transformed; but in some sense, we are losing the vision on what foundations it can be built later. We looked for these foundations in our previous reports, but now, in fact, we have given this up and can say that the moment when the changing of the world could be controlled has passed. We will talk about this later, but this means that every country – big or small – should rely on itself above all, to provide for its own stability and development. This is why it would be reasonable to consider if we are ready for this. In this sense, of course, what you say is really firsthand information. Unfortunately, our work is darkened by a tragic event. We have heard the news from Kerch. You talked about it yesterday, and we also spoke about this tragedy. What is the main thing here? Of course the first thought that everybody here – or everybody everywhere – had was that it was a large terrorist attack again. Unfortunately, we are getting used to this. But later it turned out that the situation was a bit different. Why is this coming back to me now? Not only because it just happened, but because it also brings up memories of the first Valdai Forum in Novgorod. You mentioned it; it took place against the backdrop of the Beslan tragedy. I attended that forum, and many of those who are with us today did, too. I remember it well. The discussion was, of course, erratic as everyone kept going out to see what was happening on television, for lack of smartphones. You were at Valdai then, but during the forum you recorded a televised address to the nation, which was harsh, understandably so given the context. Afterwards, when you talked to the Valdai members, you said that we had been challenged and that we would rise up to that challenge. It’s been 15 years; do you think we have? Fyodor Lukyanov: You are better at math. Vladimir Putin: I am a better listener. I would like to begin with what you did in fact, with yesterday’s tragedy. Among other things, paradoxically this appears to be the result of globalisation. We have seen whole communities spring up on the internet after the well-known tragic events in US schools. Young psychologically unstable people start to believe in false heroes. This means that we, in Russia and globally, are failing to respond to the changes in the world. It means that we are not creating useful, interesting and essential content for young people, and they turn to this surrogate heroism that leads to tragedies like this. There is a demand for true heroism in our lives. True heroism can manifest itself, in particular, by defending civilisation from today’s evils. Of course, terrorism is one of the most serious and challenging evils. I have said many times, including at the 70th session [of the UN General Assembly] in New York, that the only way to effectively stand up to terrorism is to join efforts. Unfortunately, in the true sense of the word, we have not put this cooperation in place yet. There are some aspects of cooperation where we have succeeded but this is not enough. By the highest standards, we have failed to join efforts the way we should so far, while this could be done, based on the relevant international rules of law and UN resolutions. Generally, yes, of course. Let us remember that – we tend to very quickly forget the wrongs done to us, trying to think only about positive things – a civil war was raging in Russia at the time. It was not a global war, and it did not involve the whole country but there were hostilities, a real war. Warfare with the use of aviation and military hardware and so on, a huge number of militant groups on the territory of this country, with militants coming mostly from terrorist organisations based abroad, including Al-Qaeda who were active in this country. Thank God, we got rid of this but we have not eradicated terrorism per se. Of course, terrorism still poses a great threat to our country as well, which was why we launched these operations in Syria. Terrorism is a great threat to our neighbours, including Afghanistan – I see President [Hamid] Karzai here. If he is given the floor, he will tell us what is going on in his country today – this is also a serious threat. I mean that we have not defeated terrorism globally, of course, but we have delivered a tremendous blow to it and have certainly drastically changed the situation at home – in the Russian Federation – for the better. Fyodor Lukyanov: You are naturally inducing a different reminiscence. The Valdai conference from three years ago (in 2015), took place exactly two weeks after the military operation began in Syria. Vladimir Putin: I remember this question, but it sounded like “are casualties possible?” I then said: “Yes, they are, but we must prevent the worst course of events.” And what would the worst development be for us? Full “somalisation” of that region, complete degradation of statehood and infiltration of a significant part of the militants into the territory of the Russian Federation and into the territory of neighbouring states with which we have no customs barriers, or borders in fact, a visa-free regime. That would have posed a real, serious danger to us. But we have largely ruled out that risk by our actions, because we did a lot of damage to the terrorists in Syria. Many of them were eliminated, and some of them, thank God, decided they wanted out: they laid down their arms after losing faith in the principles they considered right. This, I would say, is the most important outcome. The second, no less important thing, is that we have preserved Syrian statehood and in this sense helped stabilise the region. We talked about this in some detail with the President of Egypt just yesterday; he shares this position, and it is shared by many other countries. Therefore, I believe we have generally achieved the goals we had set for ourselves in starting the operation in the Syrian Arab Republic; we have achieved a result. Look, after all, for some years before us, countries that agreed to participate in these anti-terrorist operations, most often voluntarily, and maybe even with less than perfect goals and objectives – what result have we seen in the previous three years? None. While we have liberated almost 95 percent of the entire territory of the Syrian Republic. This is my first point. Second. We supported Syria’s statehood, prevented the state from collapsing. True, there are still many problems. Now we see what is happening on the left bank of the Euphrates. Probably, our colleagues know: this territory is under the patronage of our American partners. They rely on the Kurdish armed forces. But they have obviously left a loose end: ISIS remains in several locations and has begun to expand its area of influence recently. They took 130 families hostage – almost 700 people. I think few of those present here know that they have made ultimatums, extended demands and warned that if these ultimatums are not met, they would shoot 10 people every day. The day before yesterday, 10 people were shot. Executed. They have begun to fulfil their threats. This is just horrifying. It is a tragedy I think. We need to do something about it. Why do our colleagues keep silent? According to our information, several US and European citizens are among the hostages. Everyone is quiet, there is silence as if nothing is happening. Therefore, there is still much to be done; this is true. But I repeat, on the whole, we have achieved our goal. The next step is a political settlement at the UN in Geneva. We need to form a constitutional committee now. Progress is not easy, but we are still moving forward. I hope that we will move ahead with our partners in this area. Fyodor Lukyanov: You said, some of the militants lost faith and understood that they were wrong. First, are you sure they lost faith? Or maybe they were just overpowered, and they realized it was pointless to continue to fight, but the situation might change a little, and they will get their faith back? Vladimir Putin: Maybe. Maybe so. You are probably partly right. Some of them have really laid down their arms and really realized they had false goals. Others have simply taken advantage of our humanitarian measures for the time being, and are ready to take up arms at any moment. This is possible. This simply means we all need to be on the alert, not underestimate the threats, and step up our joint work to combat terrorism, the ideology of terrorism and the financing of terrorism. Fyodor Lukyanov: A question on current events, if I may. October 15 was a deadline set by Turkey to do certain things in Idlib. Do you think they accomplished what they were supposed to do? Vladimir Putin: No, not yet, but they are working on it. We see it. In this regard, I want to thank our Turkish partners. We see that they are working at this. This is not simple. On the contrary, everything is complicated, but they are honouring their commitments. The demilitarised zone, on which we agreed, is being created in the Idlib de-escalation zone with a depth of 15-20 kilometres. Not all heavy weapons have been withdrawn yet, and not all members of the terrorist organisations ISIS and Jabhat an-Nusra have left, but our Turkish partners are doing their best to fulfil their obligations. This, I repeat, is not easy, there is more than meets the eye. They have even deployed a military hospital in this zone because there are losses. They are acting very tough and are very effective in their fight against these terrorist groups. Fyodor Lukyanov: We are now switching to our favourite subject, which we discuss every year, because we inherited it from our American colleagues and, let’s face it, the United States is always on the agenda. In 2016, you made a very colourful statement. It was a difficult period, as we all remember, following the Ukraine crisis, and the Syria crisis was already in full swing. There was a question from the audience: “Is this not the time to reduce tensions?” And you answered, “We are all looking forward to seeing geopolitical tensions reduced, but not by way of our funeral. If the cost for reducing geopolitical tensions is our funeral, we are not happy about it.” Funeral is nowhere to be seen yet, but this method, I think, continues to be considered in some parts of the world as an option. You had the experience of talking with the President of the United States recently, and, in general, much is going on, but things are exclusively negative. I may be wrong as an onlooker, but I have a feeling that your meetings with Mr Trump lead to results that are the opposite of what’s expected. In this regard, I have a question. Perhaps, it makes sense to even stop trying and take a break? They have their own big internal problems, let them figure it out. The same goes for tensions in international affairs. We are not creating any problems for anyone Are we the ones creating problems? No. Instead, we are being accused of things. They say that Russia was “highly likely” to have done this or that, intervened at one place and wreaked havoc at another. But, no one believes it is necessary to produce any evidence. For me it is clear, and I have said this: this is the result of the internal political struggle in the Western world as a whole. Now they are fighting over the conditions for Britain’s exit from the EU; the Democrats and the Republicans are fighting in the United States, and there is controversy among the Republicans themselves. So someone has apparently decided that playing the anti-Russia card would be a very convenient way to resolve domestic political problems. This is bad for everyone. I hope this will pass, but apparently we need to wait for internal political crises to be resolved. Whether this will happen after the Congressional election or not, I do not know yet, but maybe. Or maybe it will happen in 2020, with the next US presidential election, and then he will no longer have to constantly deal with those who speculate with anti-Russia rhetoric. Were our meetings with President Trump harmful or helpful? I believe that, despite the attempt to discredit these meetings, they nevertheless were more positive than negative. Why? Because we can see what is happening there. We can certainly see, we know how to read after all, we look at what is happening there in the domestic political landscape. Still, it is better to communicate and interact with each other than, forgive my language, engage in a never-ending dogfight. Our meetings have hardly improved US domestic politics, I guess. Probably because, again, there are those who are always trying to play this card in the domestic political struggle. I would say the incumbent president is geared to stabilise and level Russian-American relations. Let’s see how the situation develops. We, in any case, are ready for this at any time. Fyodor Lukyanov: Several books about Donald Trump have been released, one after another. Vladimir Putin: We will read them. Fyodor Lukyanov: Yes, they are very interesting. They create this image of a person who only listens to and hears himself. When you meet with him, does he listen to you? Vladimir Putin: This is not true. Maybe he behaves this way with someone else – but then they are to blame. We have a comfortable professional dialogue with him. Of course he listens. And not just listens, I see that he reacts to the arguments I make. He may disagree with something I say, just as I would disagree with something he might say. We have different views on some things, different approaches, but this is a normal discussion between partners. I do not share the opinion of those who say that he speaks like a wood grouse calling out and never listening. That is not true. Fyodor Lukyanov: You know that commentators and political scientists often say that when a relationship is deadlocked and this appears to be the case, a “sobering” crisis is beneficial because the countries realise that the danger is real and something needs to be done to move beyond the abyss. The Cuban Missile Crisis was like that. Some suggest we need a similar crisis today to help the Americans shift their view from their domestic issues, and realize that the stakes are high and positive steps need to be taken. Vladimir Putin: This is a bad idea. Stirring up emotions is not our approach, as they say sometimes in our country. Generally speaking, it is irresponsible to lead the world to the brink of a global crisis whose consequences are hard to foresee. We have never used such a policy, and we will not do so in the future. Fyodor Lukyanov: Thank you, that’s a comprehensive answer. However, I will then mention another of your quotes. Speaking about antimissile systems in 2011, you said more broadly that Russia is not afraid of conflict. Back then it was one type of conflict, but today it’s different. What kind of conflict are we not afraid of today? Vladimir Putin: Any kind. We are not afraid of anything. Given our territory, our defence system, and our people that are ready to fight for independence and sovereignty – the willingness of our men and women to give up their lives for their country is not common among all nations. Nobody can change these things, and this makes us certain that we can feel secure. Fyodor Lukyanov: Okay. You said we were not creating problems for anyone, but I think that some people in this hall will challenge you on this later, because the impression is that Russia is creating a lot of problems. Vladimir Putin: Later when? Let’s get started. How long will we be sitting here? Fyodor Lukyanov: Okay, I’m sorry. Still, let’s assume this is the case. But if we aren’t creating any problems, others may be creating them for us. Vladimir Putin: Of course they are. Full ahead. Is anyone encroaching on our taiga today, or are we already living in the “that’s all” era? Vladimir Putin: “That’s all” has always been there. It is ‘that’s all” time now as well. Look, we live in a world where security relies on nuclear capability. Russia is one of the largest nuclear powers. You may be aware, I have said it publicly, we are improving our attack systems as an answer to the United States building its missile defence system. Some of these systems have already been fielded, and some will be put into service in the coming months. I am talking about the Avangard system. Clearly, we have overtaken all our, so to speak, partners and competitors in this sphere, and this fact is acknowledged by the experts. No one has a high-precision hypersonic weapon. Some plan to begin testing it in one or two years, while we have this high-tech modern weapon in service. So, we feel confident in this sense. Naturally, there are many other risks, but they are shared risks, such as environment, climate change, terrorism, which I mentioned, and proliferation of weapons of mass destruction. If we are unable to put an effective end to this, it is not clear where it will lead to, and in whose hands this deadly weapon may end up. So, in this sense, nothing has changed. We are not going anywhere, we have a vast territory, and we do not need anything from anyone. But we value our sovereignty and independence. It has always been this way, at all times in the history of our state. It runs in the blood of our people, as I have repeatedly said. In this sense, we feel confident and calm. Fyodor Lukyanov: With regard to us not going anywhere and not needing anything, clearly, there are people who will disagree with you. Vladimir Putin: Crimea is our land. We are still not going anywhere. Why is it our land? Not because we went there and took it. Even if someone decides to argue with me, the dispute will immediately come to a dead-end. Everyone is democratic here, right? What is democracy? Democracy is the power of the people. How is it exercised, this power of the people? It is exercised through referendums, elections and so on. People came to a referendum in Crimea and voted for independence, first, and then for being part of Russia. Let me remind you for the hundredth time that there was no referendum in Kosovo, only the parliament voted for independence, that was all. Everyone who wanted to support and destroy the former Yugoslavia said: well, thank God, we are fine with that. Here, however, they disagree. Ok then, let’s have a discussion, go over the UN documents, see what the UN Charter is all about, and where it talks about the right of nations to self-determination. This will be an endless discussion. However, we proceed based on the will expressed by the people who live on that territory. Fyodor Lukyanov: Now, about the people. I just remembered that at the 10th Valdai meeting in 2013 you mentioned Alexander Solzhenitsyn. One of his key ideas was that saving people is more important than anything else. Indeed, in the modern world, the competition for the people, the souls and minds and for human capital is more fierce than for the territories that may be acquired or not. Natalia Solzhenitsyn spoke on this issue at our session. We are discussing conventional conflicts here, but if we talk about conflicts or competition, certain rivalry, for human minds and souls, do you think we are prepared for it? Are we winning? Vladimir Putin: I think we are, pretty much yes. Look, there are senior executives from our television company Russia Today sitting across from me. What is happening in some countries where they operate? They are being banned. What does this mean? It means those who do so are afraid of the competition. This is what it means. We do not close anyone here, whereas they are faced with conditions that preclude their operation as mass media. Someone is making it hard for them. That means we are winning. We have just one radio station, and we are not a monopoly on this information field. We do not have global media like CNN, Fox News, BBC and so on. We do not have these. We have just one fairly modest channel. Even if it causes so much heartburn and fear of it being able to influence minds, then we are winning this competition. By the way, in France, I know, they don’t really like it, but if I ever have a chance to be in Paris, invite me, and I will come see you, see what is going on there and how things are with work. Editor-in-Chief of Russia Today TV channel Margarita Simonyan: You have our invitation. Fyodor Lukyanov: Well, that is nice. Vladimir Putin: Thank you, too. Fyodor Lukyanov: Let’s continue this subject as it is important, I believe. In the now historic speech of 2014, which is now called the Crimea Speech in connection with Crimea rejoining Russia, you mentioned the Russian world, compatriots and a divided nation. It was exciting and impressive. However, by doing so you touched on very delicate strings and awakened very powerful emotions, because this national identity, what you think about yourself and your country, your land is, of course, a very powerful weapon which can be either positive or negative. Since then, we have seen many events that have occurred, including in the Russian world, and are still unfolding, such as the Ukrainian church, and, clearly, there will be more. Here is a question that may sound somewhat audacious: Do you regret raising this subject and touching it the way you did now that we know the results? Vladimir Putin: Frankly, I am not sure I understand your question. I think it is a natural thing to do, we should always raise this issue and never lose sight of it. Our national identity is what makes us who we are. It is our culture and history. The preservation of the people, which you just said when you mentioned Solzhenitsyn, is not just about physical preservation, although, maybe, this is, above all, what Solzhenitsyn had in mind, but also about our identity as a people, otherwise we will simply erode and cease to exist. The history of mankind offers us similar examples. We will just be unable to recall the names of those peoples, who have already disappeared from our consciousness. There were lots of them. But why should we follow those examples? We want to be the Russians, or the Tatars, or the Jews, who live here, or the Mordovians, etc. We have 160 ethnic groups living in the Russian Federation. So why should we let ourselves be eroded? We treasure it and we must talk about it. We must strengthen our identity. Fyodor Lukyanov: You have repeatedly said, including at Valdai forums, that nationalism and chauvinism of any kind cause a lot of damage, first, to that people and to that ethnos, whose interests nationalists are allegedly concerned about. In 2014, you told us that you are Russia’s biggest nationalist. Are you still? Vladimir Putin: You are well-prepared, Mr Lukyanov. Vladimir Putin: He is trying to take me at my word. No, there is no contradiction here. I will explain what I meant. What are the things that nationalists say, exhibit and flaunt all the time? They say that they are the best defenders of the interests of one ethnos or another, one people or another, one nation or another. While the Russian Federation initially shaped itself, from its very first steps, as a multi-ethnic state. There are many people in this hall who deal with these matters professionally. I see the director of the Hermitage, who, though being an expert on the Middle East, knows well how the Russian nation was formed. So how did it emerge? The Russian nation did not exist forever. It was composed of various Slavic tribes. There were no Russians at a certain point. And then, on the basis of a common market, the power of the prince, a common language and, later, a common faith, the Russian nation emerged. But it consisted of various tribes. And then, when statehood started to form, the primeval form of Russian statehood, it comprised many Finno-Ugric peoples. Today, we find material evidence proving that Finno-Ugric peoples also inhabited central areas of the European part of modern Russia, and not just the Ladoga region. Russia developed as a multi-ethnic state first, and then as a multi-religious state. But it has lived for a thousand years and remained stable primarily because a very tolerant relationship was initially established between all the ethnic groups within the state and the representatives of different religions. This is the groundwork for Russia’s existence. And if we want Russia to remain as it is, to develop and gain strength, while Russians remain a state-forming nation, then the preservation of this country serves the interests of the Russian people. But if we huff out this caveman nationalism and throw mud at people of other ethnic groups, we will destroy this country – something the Russian people are less than interested in. I want Russia to survive, including in the interests of the Russian people. In this context I have said that I am the most proper and true nationalist and a most effective one too. But this is not caveman nationalism, stupid and idiotic and leading to the collapse of our country. This is the difference. Fyodor Lukyanov: If there is only you, then this is not enough. Do you have like-minded people, the same kind of nationalists? Vladimir Putin: Yes. Almost 146 million of them. Ok, Mr President, then it is agreed that Russia should not be destroyed. But you also made one very harsh statement not long ago. Vladimir Putin: Pestering me with these statements again. Fyodor Lukyanov: Well, I’m sorry, it’s my job, they pay me for it. Vladimir Putin: Will there be just the two of us debating? Fyodor Lukyanov: One minute please. Everything in its time. Can you please explain to me? You didn’t say this at Valdai: “Why do we need the world if Russia isn’t in it?” Many interpreted this in their own way, that you meant “after me, the deluge,” you know the expression. Is this what you meant, or, I suspect, you meant something else? Vladimir Putin: No. First, King Louis XIV said that in response to the accusations that he was spending too much money from the treasury on all sorts of palaces and entertainment. By the way, it was not such a waste, because after him a lot of things remained, palaces included. And second, he was also a statesman. If I remember correctly, he created the first regular army in Europe. Therefore, all the talk of his extravagance probably had real reason behind it, but this does not mean that he actually did what he once said during an argument. As for my statement you quoted, I don’t remember, but I probably said it to Vladimir Solovyov. Fyodor Lukyanov: Yes, in the film. Vladimir Putin: But you cannot quote things out of context. I will remind you what this was about. I was asked whether we were ready and whether I was ready to use the weapons we have, including weapons of mass destruction, to protect ourselves, to protect our interests. And that’s what I answered. I will remind you of what I have said. I have said that our nuclear weapons doctrine does not provide for a pre-emptive strike. I would like to ask all of you and those who will later analyse and in one way or another interpret my every word here, to keep in mind that there is no provision for a pre-emptive strike in our nuclear weapons doctrine. Our concept is based on a reciprocal counter strike. There is no need to explain what this is to those who understand, as for those who do not, I would like to say it again: this means that we are prepared and will use nuclear weapons only when we know for certain that some potential aggressor is attacking Russia, our territory. I am not revealing a secret if I say that we have created a system which is being upgraded all the time as needed – a missile early warning radar system. This system monitors the globe, warning about the launch of any strategic missile at sea and identifying the area from which it was launched. Second, the system tracks the trajectory of a missile flight. Third, it locates a nuclear warhead drop zone. Only when we know for certain – and this takes a few seconds to understand – that Russia is being attacked we will deliver a counter strike. This would be a reciprocal counter strike. Why do I say ‘counter’? Because we will counter missiles flying towards us by sending a missile in the direction of an aggressor. Of course, this amounts to a global catastrophe but I would like to repeat that we cannot be the initiators of such a catastrophe because we have no provision for a pre-emptive strike. Yes, it looks like we are sitting on our hands and waiting until someone uses nuclear weapons against us. Well, yes, this is what it is. But then any aggressor should know that retaliation is inevitable and they will be annihilated. And we as the victims of an aggression, we as martyrs would go to paradise while they will simply perish because they won’t even have time to repent their sins. Fyodor Lukyanov: I feel the urge to address Metropolitan Tikhon right away, however, I will do this a bit later, if you do not object. I take it that you, Mr President, are bored with me as an interlocutor, so let me ask you one more question and then people from the floor will ask questions. As a follow-up to what you said regarding a reciprocal counter strike and who will go where, last evening we had a remarkable meeting where Valery Gergiev gave a speech. He, in addition to being a great musician, is a man who plays an active role in social life and civil society. He spoke about many things. He also said this: in his opinion, three countries and their three leaders have a great responsibility. These countries are – you can name them in any order – the US, Russia and China. Everything depends on them. They can achieve things and prevent things. In general, I agree with this. I think it is obvious that there are three countries that have more opportunities and a greater potential, both destructive and creative. As a leader who carries this burden, do you ever feel scared? Or do you not think of it at all? Vladimir Putin: What do you mean by ‘scared’? Fyodor Lukyanov: It is a great responsibility.You are one of the three people responsible for the entire world. Fyodor Lukyanov: You have no fear? Fyodor Lukyanov: All right, no further questions. Vladimir Putin: You know, this is actually a tricky question. Why? Because fear is the reverse side of the self-preservation behaviour that all people, all living things have. Everybody has the self-preservation instinct, and fear is an integral part of it. It is how we respond to a threat. You know, after I graduated from university and went to work for the security services and then intelligence, this is how we were trained: if you have taken up something, some job, you need to think through in advance what it involves. And when you take it on, you need to act carefully, cautiously and responsibly, and you need to assess all the risks. It is extremely important, especially for people who are responsible for their compatriots, for millions of people. You mentioned earlier that during the tragic events of the late 1990s-early 2000s, when I flew over Grozny I saw that it had been destroyed completely, like Stalingrad. Shots could come from behind every rock, and they did, by the way . We flew at a low altitude above some areas because it was too dangerous to fly higher. It was the first time I saw that a helicopter could fly so low and so fast; I did not think it was possible. But it was my choice, you see? And it is still my choice. I think it is the same for everybody, for all of my colleagues. But if you have decided something for yourself, if you have made your choice, you must act without thinking about some negative consequences for yourself. You must think about a positive outcome for the people you are doing this for. Fyodor Lukyanov: There are two aspects to fear. On the one hand, what you are talking about is your internal feeling, and on the other hand it is a leadership style. Do you think ruling by fear is an effective way to govern? Vladimir Putin: No. It is a bad management method, because it is very unreliable. The best way to govern, in terms of having contact with society, is by convincing people and using positive motivation. It requires the joint efforts of the people you communicate with. You must not allow any separation of those who make decisions from those who implement them. All people should collaborate in the implementation; that would be efficient joint work with a positive result. Fyodor Lukyanov: Let us move on to joint efforts. Sheng Shiliang is our old-timer. Secondly, Russia and China are declared, along with Iran and North Korea, to be the main adversaries of the greatest, most peaceful, and most offended country in the world and of all times. Thirdly, there are the sanctions imposed on you, and the trade war waged against us. The situation is very serious. I have a quote from a well-known Hong Kong mafia film: the uncle is very angry; the consequences will be very serious. This means we have much in common. I would like to ask you how Russia is going to respond. And what recommendations would you give to us, to China? Vladimir Putin: My dear friend and colleague, I think China is no less a great country, and the Chinese people are no less a great nation than the one you have just mentioned. The Chinese civilisation is a great ancient civilisation. I do not think China even needs our recommendations. I can only express my point of view on this matter. You cited the Chinese proverb, the trees want to remain quiet, but the wind will not stop. However, the weather is changeable. A time will come when the wind will calm down. It seems to me one does not need to immediately respond to certain things that might aggravate the situation in some way. But one must certainly always respond and protect one’s own interests. As a matter of fact, we are doing just that – both China and Russia. So why am I saying that the weather is changeable, and the wind will stop blowing at some point? The fact is that those who stir up this wind, they also suffer from it. You mentioned trade wars and sanctions. You know, I am not even going to say anything new for some people here in this hall, the experts will understand what I am talking about. Firstly, a certain part of US rhetoric is related to their domestic political situation. Secondly, what is the domestic policy calendar? Midterm elections are underway, which will be followed by the presidential election. Certain economic trends need to be preserved. In the medium term, such actions may lead to a positive result. However, in the long term, in my opinion, negative consequences will follow inevitably, because everything that is being done now affects the global economy and influences its segments in individual countries. The US and China exchange blows that cost some $500 million. And if they keep doing so, it will amount to $1.5 trillion, which is 0.4 percent of the global economy. It will be one of the reasons for a future recession of the global economy. Everyone will feel it and nobody wants it to happen. Therefore, it is possible to stir up a wind at some point, but a moment will come when it will not benefit anybody. Therefore, I think the Chinese civilization is very old, the Chinese people have a lot of patience and I think the fundamental structure of the Chinese economy will allow them to endure everything. In terms of volume, the Chinese economy has outgrown the US economy; the per capita figure is still smaller, of course, taking into account China’s huge population. Of course, the American economy is high-tech and introduces contemporary innovative technologies quickly, so both Russia and China have something to work on and to learn from our American colleagues. Nevertheless, the world is changing and so is the global economy; the growth rate of the Chinese economy is high. It has adjusted, as we see, but it remains high. It will inevitably lead to a change in the economic situation between countries and in the global economic environment. This poses certain threats, and not only for countries, but for the global economy as well, I would say.